(Mill Shoals) Mills Prairie High School "Panthers"
Mill Shoals (population 235) is located in northwestern Wayne County in the far southeastern portion of Illinois. Mt. Vernon is located about 25 miles northwest of Mill Shoals. U.S. Route 45 is the main roadway through town and connects it to Interstate Highway 64 just one mile to the north. The Prairie Trunk Railroad travels through town. A branch of the Skillet Fork creek flows to the west of town. The town was platted in the mid 1850s. Burnt Prairie (population 58) is located in southeastern Illinois in northwestern White County. In terms of town size Burnt Prairie is #1,297 out 1,313 Illinois towns. It is actually the 14th smallest incorporated town in Illinois when you consider "ties". The main road through town is White County Highway 20. Interstate Highway 64 sits just north of Burnt Prairie and U.S. Route 45 runs just 4 miles to the west. 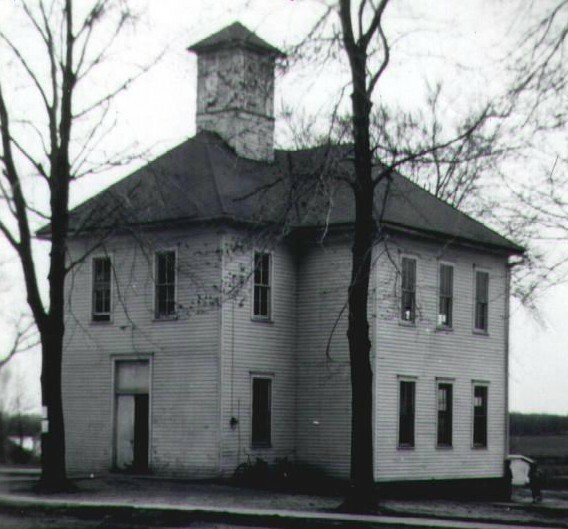 The history of Mills Prairie school system is in need of research. High schools were probably established in both Burnt Prairie and Mill Shoals in the late 1800s. Our guess is that the two towns agreed to merge their educational efforts in the late 1940s, possibly 1948. A high school was built midway between the two towns in a country setting. We know that Mills Prairie High School existed at least through 1971, the last year the high school boys basketball team won a District title. We are told by the very last Mills Prairie student to receive a diploma from the school, William Winters, that Mills Prairie High School closed its doors after the 1976-77 school year. The children of Mill Shoals and Burnt Prairie now attend school in nearby Fairfield. The fate of the Mills Prairie High School building is a good one, as told to us by Dixi Blackford. "My family currently owns the Mills Prairie High School building. My husband, Rod Blackford, still has many of the yearly class pictures still framed. Until a few months ago we also had many trophies but the school was vandalized and all metal, including trophies and plumbing, were stolen. Rod's grandmother was on the school board to build the school and can get much information for your web page. His father, Kenneth Blackford, attended school here and purchased it around 1987-88. We are currently remodeling the school to live in and also open up an organic grocery store and restaurant. The school has been used by our family for flea markets, antique store, restaurant, political rallies and dances." Mills Prairie HS team nickname: the "Panthers"
School Fight Song: "We're Loyal to You, Mills Prairie"
We're loyal to you, Mills Prairie High. We're gold and we're blue, Mills Prairie High. For we know that you can, Mills Prairie High. So crack out that ball, Mills Prairie High. We're backing you all, Mills Prairie High. For we expect a victory from you, Mills Prairie High! Basketball and baseball for the boys were offered. Coach's names and team records are being sought. In fact any information on the history of Mills Prairie High School sports is welcome. The boys basketball team appears to have been the pride and joy of the Mill Shoals Mills Prairie High School fans. The program won a total of five District titles during its existence. Unfortunately the coach's names and team records are not currently available for these and other great Mills Prairie teams. "The annual school yearbook was named "Crystallite". The school newspaper printed by the senior students was called "The Panther's Tale". Mills Prairie was a four-year high school. My graduating class in 1959 had only 20 students. Boys' basketball and baseball were the only competitive sports, but the school offered a good basic curriculum. There was also chorus and band, an active Future Farmers of America, cheerleaders, Future Homemakers of America, and a student council. Two drama productions were done most years. An annual prom was also held." "I'm an alum of Fairfield High School, Class of '84, but both of my siblings and both of my deceased parents attended now defunct schools. My mother and both my siblings attended Mills Prairie High School located in Mill Shoals. Although the school district straddled the Wayne and White county line, the school itself was in White County. My sister was a cheerleader for four years and never cheered for a losing team. She graduated in 1969. My brother was in the last graduating class from Mills Prairie in 1977. The school had only 45-50 students the last year of its existence. To be honest, the school never had much of chance of survival. The borders of the district looked a puzzle piece. ....a small portion of the Enfield school district extended to within a half mile of the school. Obviously, Enfield was the biggest rival. It wasn't necessarily a friendly rivalry either. It did, however, make for some interesting times in our home because my Dad was an Enfield graduate and claimed to be a loyal Trojan. When Mills Prairie closed and then Enfield a few years later, the rivalry ended with all the kids attending Fairfield and Norris City schools. I put out a call for pics of the gym at Mills-Prairie High School....it was a gorgeous little gym.....absolutely state of the art when it was built in the late 60s. So very unfortunate it was only used for 10 years. One of the best features was large a mural of a panther (I'd guess it was about 10' x 8') that a very talented student painted in the early 70s. Without a doubt it was the best piece of art I've ever seen in a high school gym. I wish that building and gym had been taken better care of over the years. When Mills-Prairie consolidated into Fairfield in 1977, Fairfield just left it as is, including all the composite pics of graduates, trophies, etc. Most of the furniture was left, too. The building was leased to a governmental agency that oversaw Head Start, etc for several counties for about 8-9 years, but they abandoned it when Enfield High School closed and they moved there. Then the school was sold and is nearly dilapidated now. Vandals apparently broke into the building a few years ago and smashed most of the windows, stole old trophies"
**Vicky King, Class of '72, retired as the principal at Carbondale Community High School and served as a member of the IHSA Board of Directors. **Ray Griffith, Class of '71, is the President and CEO of Ace Hardware in Oak Brook, Il.